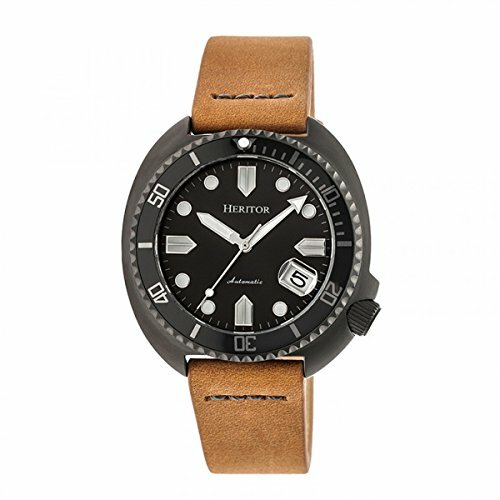 Heritor is one of those recent brands that seems to have popped up out of nowhere. They use “out of the box” movements to power their watches, like many of their counterparts, and then add their own touches in the design. Their designs are actually quite impressive for a company that has little to no history, and I am going to dive into some of their best models in this review. Just keep in mind that for the price point, you can often get a better or comparable watch from Seiko or Citizen. 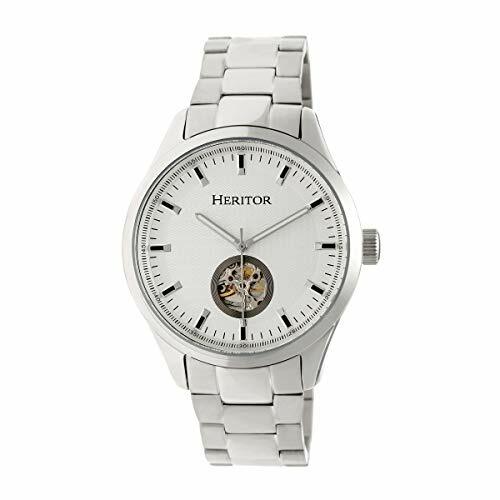 Heritor typically puts automatic movements in their watches which is a great start. That means they are far more complex and costly than their quartz counterparts, and great to look at. Of course, most movements you can’t actually see (because they are inside the watch) but in this case, Heritor has put a display back on the case! The case style is quite unique, and very much reminds me of the Seiko Turtle or other oblong shaped cases out there. And like Seiko does on many of the Seiko 5 models, this watch has an offset crown, complete with guard, at the 4 o’clock position. Complementing that at 4 o’clock is a rather large date window with their own version of Rolex’s cyclops window to make reading it at a distance even easier. The rest of the face and bezel are very standard for divers, and hark back to the Rolex Submariner’s original design which nearly every manufacturer has taken inspiration from. All in all this is a great design with a unique look and style when combined with the stitched leather strap, makes for a watch you can wear almost anywhere. If you want something a little more classic and minimal, then the Crew is a great option. Heritor tend to go for very brash designs, so this one is quite held-back in comparison. The only over the top element is the skeleton section at 6 o’clock which displays some of the movement. The rest of the watch is very “vanilla” in terms of dress watches. With a white face, circular stainless steel case and bracelet, there is not much to comment on. But I suppose that is part of the appeal of this watch, it’s great for work or going ou, even though at 46mm it is a little oversized for a dress watch. Another of Heritors more dress style watches is the Hoyt. 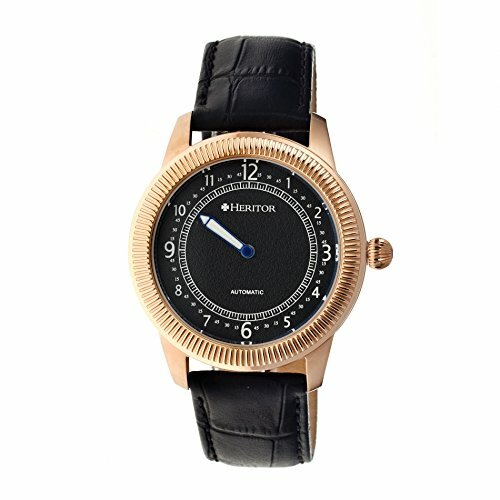 This watch, however, is heading more in the direction of the others I will show you below – with a rather unique design. The case is very thick for the size of the watch, but I believe it is done to show you the ribbed design, which is complemented by the rounded crown. The minute train and inner circle are also rather unique on the plain-colored dial, with Arabic numerals at every hour, but larger every 3 hours. And if you had not noticed already, this is one of those “single handed” watches that are quite in trend at the moment. Not so easy to tell time accurately with, but they sure get people’s attention. 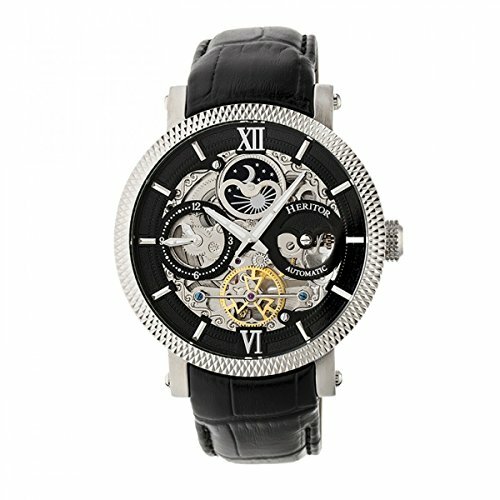 If a more outlandish skeleton style watch is something you are looking for, then perhaps this is the watch for you. 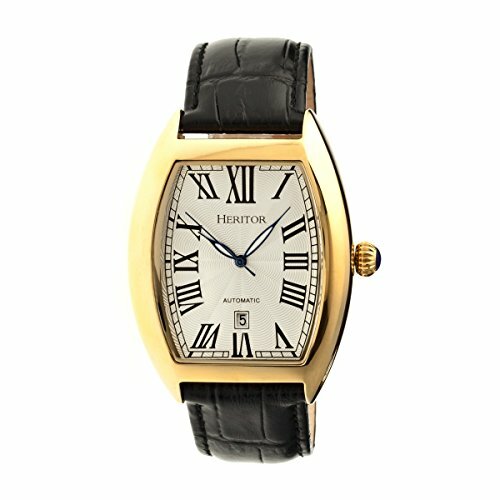 With the Roman numerals at 6 and 12, as well as the alligator leather strap, this classic style watch is one for a night out on the town. Most of the skeleton display is there it show off the automatic movement, but the left hand sub-dial is a separate time zone you can set, which is handy if you travel or call overseas a lot – something I do all the time. 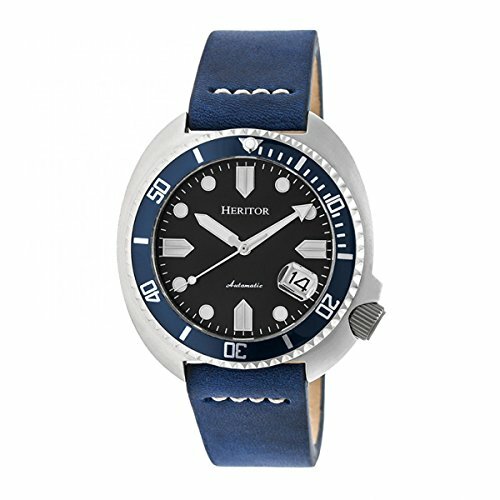 And like the rest of the Heritor collections, this model also comes in a variety of colors and straps. Jumping back to the far more old-school Cartier tank style watch, the Heritor Redmond is for those of you looking for a whole lot of class. Cartier came up with this design, more or less, many decades ago, and unsurprisingly it became a classic. The thick gold-plated case and crown go well with the clean white dial and Roman numerals, that have a weird way of curving around the dial. They have also snuck in a date window, albeit a subtle one, at 6 o’clock, which is handy for those of us who never know what date it is. And to touch it all off, there is an alligator leather strap in black. 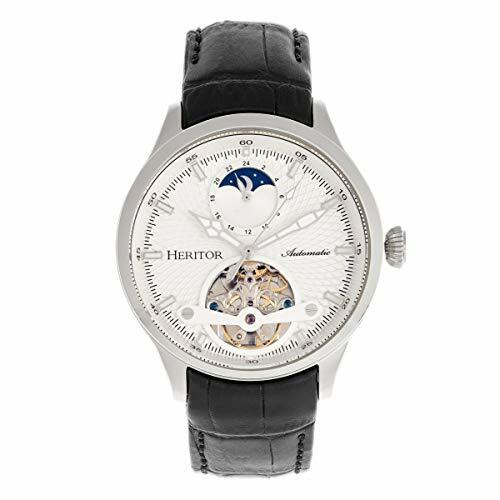 The final Heritor watch I wanted to mention in this review, is the Gregory. I comes a whole lot of classic, with touches of skeleton and moon phase thrown in for good measure. Again, the case and strap are all very dress in terms of design, but it’s the small things they have added which are interesting. The minute markings on the minute train around the dial, with the rectangular hour markers added on. The crown reminds me of the old aviators of old, and the lovely skeleton display at 6 o’clock is surely going to attract some attention. The sub-dial at 12 o’clock is also worthy of your attention, with 24 hour time and moon phase. There is also a display back on the case so you can sneak a peak at the movement ticking away too!